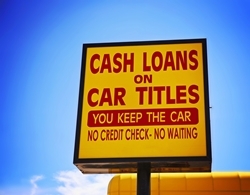 Be Wary of Car Title Loans | The Consumer Law Group, P.C. If you find yourself in need of quick cash, you may be convinced by too-good-to-be-true loan promises to use your most valuable possession—your car—as collateral. These loans, known as car title loans, can be deceptive and can cost you way more than you bargained for—or your car—if you don’t repay on time. Car title loans in Virginia are governed by the Motor Vehicle Title Loan Act. These are high-interest loans backed by your vehicle's title as collateral. If you miss a payment, your vehicle may be repossessed. Under Virginia law, a car title loan term cannot be less than 120 days or more than 12 months. The cash you receive for a car title loan cannot exceed 50% of your car's "blue book" value. You have the right to make a partial payment before your due date and also have the right to repay the loan in full before its specified maturity date without penalty. If you do not repay your car title loan in accordance with your loan agreement, the car title lender may repossess and sell your car to recover any outstanding amount that you owe. A car title lender is not allowed to seek a court judgment against you for any unpaid balance under a car title loan. Violations of the Motor Vehicle Title Loan Act may be pursued under the Virginia Consumer Protection Act. Virginia car title lenders are now offering "consumer finance loans" to its unsuspecting customers. A consumer finance loan comes with higher interest and less protection for the borrower. These loans may offer an even higher interest rate than a traditional title loan and may last up to two years. These loans keep customers on the hook for interest longer and leave borrowers with less protection than under an already unsavory car title loan. The way these "bait-and-switch" works is that the car title store you are used to seeing and visiting hasn't changed. Same store, same sign, and same advertisements. You walk in the store thinking you'll get a car title loan as advertised or as you've gotten before. The process is the same - you discuss your vehicle, mileage, and an employee will take pictures of your car. The pa perwork is drawn up and they rush you through signing it only discussing how much money you'll receive today once you sign on the dotted line. Failing to mention the high interest and longer loan term. The main thing they forget to tell you is that you are actually not agreeing to a car title loan, but rather a consumer finance loan. Instead of agreeing to a 12 month or less car title loan, you are now stuck with an up to 24-month consumer finance loan with your car title still the sole collateral. So rather than pay 12 months of triple digit interest under a title loan at the risk of losing your car, you are now duped into receiving the same amount of cash but agreeing to pay 24 months of triple digit interest at the risk of losing your car. And the lender can come after you for any unpaid balances on your car. If you believe you were misled when signing the terms for any type of loan, or feel you are the victim of a bait and switch contact The Consumer Law Group, P.C. to see if you have a case. Use the contact form on this page to get started or call (804) 282-7900.